A while back, we added the Organ Historical Society to the CV Definitive Linkroll. 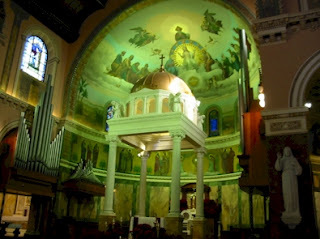 On this site you can search the database for pipe organs that are or were in a given church. In May 2006, I had written a post about the five (yes, only five) Aeolian-Skinner organs in all of Rhode Island. One of the churches mentioned was Blessed Sacrament in Providence, RI, home of an Aeolian Skinner built in 1968. I had done a search under Providence yesterday out of curiosity. They had listed a three-manual Austin built "before 1905". On behalf of the OHS Database Committee, thank you for sending information through our on-line form. During the review process, we discovered that the changes you described were extensive enough to warrant making a new entry. We therefore used the information you submitted to create this new entry and linked it to the previous one. Identified through on-line information from Brian Michael Page. WOOHOO! I feel as if I just made my own page for the OHS! Humbled, yet thrilled, am I! PS: Incidentally, I just added the Aeolian-Skinner archive pages to the CV Definitive Linkroll. It includes a couple of interviews, a brief timeline of the company, and opus lists for Aeolian-Skinner, E.M. Skinner, E.M. Skinner and Son, and Bassett-Skinner.